Whether you are a Florida Gator or not, now that retirement is here what better place to retire than Oak Hammock CCRC at the University of Florida in Gainesville. To Star Bradbury, Director of Marketing at Oak Hammock, the attractions are obvious. “Oak Hammock takes care of the big 3 concerns that forward-thinking retirees have: quality healthcare, financial security, and a rich and fulfilling lifestyle.” Her enthusiasm is justified by the success of the University of Florida sponsored CCRC – the community is 96% occupied, has a 4-5 year waiting list, and attracts visits from universities around the world who would like to learn from its success. Star was kind enough to spend some time with Topretirements during an early 2008 visit to their lovely campus, set among live oaks draped with Spanish moss. It was clear from our visit that the university-affiliated model of CCRC (Continuing Care Retirement Community) is one of the most successful models of retirement living. Residents at Oak Hammock fit a fairly wide demographic, ranging in age from 56 - 96. More than 60% previously lived outside the Gainesville area, and 50% had some prior relationship (alumni or faculty) with UF. Typical new residents arrive her in their mid-70’s, sometimes moving here from an over 55 or active adult community. There are a variety of floor plans ranging from 2300 sq. ft. homes to studio apartments. 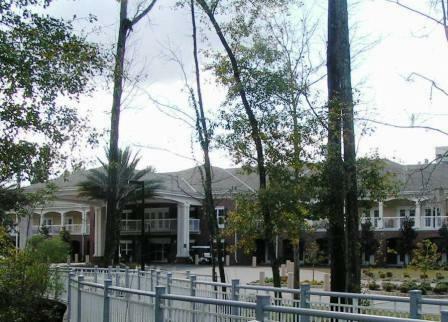 Oak Hammock has an exhaustive list of facilities and programs, ranging from walking trails, tennis court, Fitness Club, concierge services, Dean of Residents, and the Institute of Learning in Retirement. As in other CCRC’s, the monthly fees are almost totally inclusive, including meals, maintenance, access to all facilities, security, utilities, housekeeping, shuttle transportation, parking, property taxes, etc. This includes guaranteed unlimited long term care in the Health Pavilion, which includes Assisted Living, Skilled Nursing, and Memory Care. An on-site Rehabilitation Clinic for Physical Therapy and Occupational Therapy is also included. Fees range from about $1775 to $5262 per month, depending on plan and size of home. A second person can be enrolled at a substantial discount. Residents can choose from different refund plans. The most significant benefit of the Oak Hammond package is the assurance that resident’s long term care needs will be taken care of. We asked Ms. Bradbury why a retired person should consider moving to a community like Oak Hammock at the University of Florida. At the top of her list is its university setting and relationship with the UF Medical School. UF’s Shands Hospital is deeply involved in all medical aspects of life in Oak Hammock. Its doctors, professors, interns, and students provide top notch care, along with wellness advice and programs. Even the UF Veterinary School of Medicine is involved, as it operates the Vet Clinic at Oak Hammock! But Bradbury’s main point is this: with the aging of the baby boomer population, quality health care is going to become an increasingly scarce commodity. People who live in CCRC's that have ongoing relationships with university medical schools and hospitals are going to get top priority with their medical needs. See this list of the best college towns in the U.S.